In 2009 (or 2010), a New Mexico millionaire (and modern-day Indiana Jones) gave the world a fascinating puzzle when he hid a treasure estimated to be worth between $1-5 million dollars and provided a cryptic poem full of clues hinting at its location. Tens of thousands have trekked through Colorado, Idaho, Montana, New Mexico, Utah, and Wyoming in search of Forrest Fenn’s hidden treasure. To date, the location of the treasure remains a mystery, despite a plethora of clues pointing to its location. Forrest Fenn, millionaire writer, art dealer, and artifact collector, says he hid his treasure to get people off of their couches and into the wilderness. To say Forrest Fenn himself is a modern-day Indiana Jones would be an understatement. Fenn flew more than 300 missions in Vietnam and was shot down twice before retiring from the Air Force. From there, Fenn opened an art gallery in Santa Fe, New Mexico where his business quickly grew serving high-end clients including Jackie Kennedy, Ronald Reagan, Robert Redford, Steven Spielberg, Gerald Ford, John Wayne, Cher, and several members of the Rockefeller family. His hard-earned wealth allowed him to retire from the art gallery in 1988 and direct his energies towards his true love, archaeology, and writing books about his many adventures. Yes, Fenn has adventures in droves. When he’s not galloping around the world’s mountains, forests, and deserts looking for ancient artifacts, he’s dodging FBI agents eager to swift away his treasures. In 2009, just one year before his decision to bury the treasure, the FBI raided Fenn’s home in connection with a multi-state investigation into grave-robbing and artifact theft in the Southwest United States. An undercover FBI agent had toured Fenn’s shop, filled with hundreds of wondrous ancient finds, and decided Fenn must have robbed graves. The case is still ongoing and although the FBI, Bureau of Land Management, and Fenn refuse to comment on it, Fenn’s general disdain for the government’s heavy-handiness is all-too-apparent (the importance of this is noted below). In 1986, Forrest Fenn was diagnosed with terminal kidney cancer. The diagnoses was especially devastating to Fenn as just one year earlier, his terminally ill father (pancreatic cancer) took 50 sleeping pills and died by his own hand at his home in Texas. Given a 20% chance of survival, Fenn found himself in a similar situation. He underwent chemo and radiation treatment despite doctors insistence that no matter what they did, the cancer would almost certainly return. For Fenn, death by cancer was not an option. In addition to surviving against the odds, Fenn was determined to leave behind a legacy. He thought about leaving behind various caches of hidden bronze bells, each stuffed with a copy of his life story. In fact, he buried several of these bronze bells before his circumstances turned dire prompting a change in aspiration – and generosity. According to Fenn, he intended to die, with his treasure nearby, in the wilderness that he loved. Fate however, dealt Fenn a surprising hand. Against all odds, Fenn survived his battle with cancer. After further thought, he decided to go ahead and bury his treasure hinting that the hunt would encourage families to head outdoors, explore nature’s wonders,and get kids “away from their texting machines”. And so, in 2009 (or 2010, the exact year the treasure was hidden has never been revealed), Fenn filled a lockbox with treasure and “hid” it outdoors. The lockbox Fenn filled with treasure is a treasure itself – it dates to about 1150 AD. It measures 10x10x5, weighs 42 pounds (including its contents), and is constructed of ancient bronze. Fenn filled the box with gold nuggets (hundreds, some as large as a chicken egg), 265 gold coins (mostly American eagles and double eagles), rare coins, pre-Columbian gold animal figures, jewelry (including a Spanish 17th century gold-and-emerald ring and a bracelet with turquoise beads excavated in 1898 from Mesa Verde which Fenn says he would like back if the treasure is found while he is still alive), and gemstones – hundreds of rubies, diamonds, emeralds, and two Ceylon sapphires. Oh, and a 20,000 word autobiography sealed in a glass jar. After Fenn hid the treasure, he published a memoir (The Thrill of the Chase) containing a cryptic poem with nine clues directing treasure-seekers to the chest’s secret location. Sales for Forrest Fenn’s 2010 memoir, titled The Thrill of the Chase, slowly gained momentum after media outlets began reporting on the exciting hidden treasure the eccentric millionaire whisked away into the wilderness. It was especially notable that all proceeds from the book were assigned to a local bookstore with half of the monies distributed to a cancer-patient assistance organization. Inside the memoir was a 24-line poem containing nine clues (see full poem and analysis below). Fenn insists, even years later, that everything needed to find the treasure is in the poem (and further suggests that a single word in the poem is critical to the solution). If you ask Fenn today how to find the treasure, he will tell you flatly, “go back to the poem”. After the publication of The Thrill of the Chase, Fenn occasionally released additional hints and subtle clarifications. A 10th clue was revealed on the Today Show on March 1, 2013 when he added that the treasure was hidden more than 5,000 feet above sea level in the Rocky Mountains somewhere north of Santa Fe. On March 27, 2013, an eleventh clue was revealed on the Today Show when Fenn cautioned that there was “no need to dig up old outhouses, the treasure is not associated with any structure.” Later Fenn added that the treasure is not in a graveyard and narrowed down the search area to a four-state zone – New Mexico, Colorado, Wyoming, and Montana (specifically, he said the treasure was not in Idaho or Utah). Since 2010, various additional clues have been revealed by Fenn, some via email to frustrated treasure hunters, some in media interviews, some via casual comments on websites. Below is a mishmash collection of theories and extraneous clues regarding the possible location of Forrest Fenn’s treasure. Is Forrest Fenn’s treasure hidden on government-owned public land? Is the Forrest Fenn treasure in Yellowstone Park? Many believe the treasure is located within or near Yellowstone National Park in Wyoming and Montana. It is common knowledge that Fenn is quite fond of Yellowstone (once saying “I absolutely love that place”) and he has been known to travel to Montana, through Colorado and Wyoming, on several occasions. In fact, his family spent much time in Yellowstone during his youth. Fenn’s family spent at least 20 summers in Yellowstone National Park. His mother died in a trailer park near Cameron, Montana, just north of the park where the west fork of the Madison River runs into the Lower Madison River. The Fenn family often camped near Fishing Bridge (a structure that spans the Yellowstone River as it exits Yellowstone Lake) at a location where Fenn remembers Grizzlies (think “brown”) killing several people each summer that he was there. The Fenn family also camped often in West Yellowstone where Fenn recalled a “secret location” where his family would stash their gear. According to Fenn, the gear was always there when they returned. In Fenn’s The Thrill of the Chase, he recalls the family’s favorite fishing spots along the Madison River – Slow Bend, Nine Mile Hole, and the Water Hole. All of these spots he held dear, especially Nine Mile Hole which Fenn recalls “could only hold one fisherman”. Is Fenn’s treasure in Arizona? Fenn has narrowed down the location to New Mexico, Colorado, Wyoming or Montana but earlier researchers believed the treasure could be hidden in Arizona. In fact, Fenn’s time in Arizona may provide clues to the treasure’s location – he spent much time exploring the rocky areas in Arizona in his younger days. Fenn began exploring Arizona in the 1960’s when he trained pilots at Luke Air Force Base. Fenn once described how, inside one of these hidden caves, he had found an ancient broken pot on the floor of the cave, just below a splintered, decaying wooden peg sticking out of the cave wall. Where would a man conceal his dead body? It is helpful to remember that when Fenn first decided to hide his treasure, he intended to entomb himself along with the chest (and still might). In fact, an earlier draft of the poem included a line which said something similar to “then take the chest and leave my bones”. Many have noted that his early plan could provide clues related to the size and makeup of the area the treasure is hidden in – it would need to be large enough to contain both the chest and his body. As for the future, Fenn has not ruled out following through with his decision to die next to his treasure. How could the treasure be easy to find when the poem says getting to it is “too far to walk”? One of the most puzzling clue is the line that reads, “Not far, but too far to walk”. On several occasions, Forrest Fenn has stated that the treasure was easily accessible, “even a 3-year-old could find it”. He has also noted that while transporting the treasure, it took two trips from his car to the treasure’s final resting place. However, the directions in the poem appear to contradict this when they state that the treasure is “not far, but too far to walk”. How could this be? Some believe there are multiple ways to approach the treasure – and easy way, and a hard way. For instance, the treasure could be located just off the edge of a cliff with the only means to reasonably reach it from below. Others believe that the line hints that an alternate means of transportation (e.g. boat, horseback) is required to reach the treasure. Still others believe the phrase is simply saying, “get in your car and drive down the road a bit further”. Is there a clue on the cover of The Thrill of the Chase? Sometime in 2013, a reader discovered what may be a clue on the cover of The Thrill of the Chase book. When the book is turned upside down, the four photographs on the cover resemble the states of Idaho, Utah, Wyoming, and Montana with a pile of gold coins representing the mapped area of Montana. Coincidence? Forrest Fenn is no introvert and speaks often to fans, bloggers, and the media. Below are a collection of Forrest Fenn quotes that may have “accidentally” provided clues to the treasure’s location. Researchers have gleaned various potential clues from Forrest Fenn’s media interviews, website postings, and personal email communications. Below are additional facts (?) hinting at the treasure’s location. The treasure is not in Nevada. The treasure is at least 8.25 miles north of Santa Fe. The location of the treasure is “not associated with any structure”. The treasure is “not in a graveyard”. The treasure has been confirmed to be in either Colorado, Montana, New Mexico, or Wyoming. Fenn has revealed that several treasure hunters have come within 200 feet of the chest but where unaware of how close they really were (“They walked right past it.”). Fenn has said many times that nothing about finding the treasure will be accidental implying the treasure cannot be discovered simply by stumbling across it. Fenn says he prefers to say that the treasure is “hidden” rather than buried because he does not want to give that away as a clue (a fact he quickly emphasized in an email to Altered Dimensions when I mistakenly wrote that the treasure was “buried”). Personally, I believe it may be buried (which would explain why Fenn says nobody is ever going to stumble across it) and Fenn’s insistence on labelling it “hidden” is intended to avoid any potential legal problems that could result from digging for the treasure on government land. Fenn once told an author that he hid the treasure in a place he has known about for years. Fenn has admitted that the treasure is readily accessible and that when deciding on the location (which he says he gave much thought), he was thinking “10,000 years down the road”. He explained that when hiding the treasure he “considered mudslides, forest fires, earthquakes, and floods”. Fenn once told a reporter that the chest was “exposed” to rain and snow and that it could be scorched in a forest fire. Fenn has admitted that although the chest contains a lock, it is unlocked. In 2018, 53-year-old Jeff Murphy died from a 500 foot fall to the bottom of Turkey Pen Peak while looking for the Fenn treasure. Reports surfaced that Fenn told authorities he had never been to the location where Murphy was looking. Fenn once teased a blogger telling him the treasure was “more than 300 miles west of Toledo”. He later admitted that he gave the blogger the line in jest and that “there is no clue there”. The Forrest Fenn treasure – an exercise in futility? Given the difficulty of Fenn’s puzzle, many wonder if Fenn’s treasure is an elaborate hoax. Fenn however, insists he cares not whether the treasure is ever found or not. A ploy to sell books? Fenn is an expert archaeologist and truly a modern day Indiana Jones. Hiding a treasures is right up his alley (Fenn even purchased his own ancient Pueblo, previously a National Historic Landmark, so he could dig to his heart’s content) and perfectly within his well-proven set of skills. An ingenious means to cloud the FBI’s investigation of his artifact collection? Another purpose behind Fenn’s treasure hunt could be to cloud the FBI investigation of his collection of ancient artifacts (an undercover FBI ancient triggered an investigation of Fenn’s collection when he witnessed the massive cache he held in his Santa Fe studio). Fenn’s treasure hunt has sent tens of thousands of people (an estimated 10,000+ people each year) onto federal properties searching for the treasure and likely carrying off any ancient artifacts that they run across during their adventure. In addition, Fenn receives thousands of letters, emails, and other communications regarding the treasure creating a spaghetti-thread of interactions the FBI must sift through during their investigation into his dealings. Below is the full text of the Forrest Fenn hidden treasure poem. In the poem, there are nine clues, likely in chronological order. All clues in Forrest Fenn’s treasure poem are in consecutive order – just as if you were following a graphical map. The poem was originally written when Fenn thought he was dying of cancer (and planned on leaving his corpse next to the treasure). It was later refined after he survived his bout with cancer and decided to go ahead and hide the treasure anyway. And remember, nobody is truly sure which of the 24 lines are the “9 clues”. Likely describing Fenn’s act of hiding the treasure by himself. Likely describing the “bold” contents of his treasure chest. Seems to end in mid-sentence. Where was the secret treasure left? Potentially referring to a location that once held riches – an old mine, an archaeological site, cave he has visited in the past. Could be describing the contents of the treasure chest – old and new treasures. Could be a generic reference such as bottom of a waterfall, the warm, shallow edge of a lake or river, snow melt from a mountain, or the elevation boundary line on a mountain where snow begins to form. Could be referring to the boundaries of Yellowstone Park’s thermal basin. Yellowstone’s Hebgen Lake and The Boiling River are locations often suggested where the warm waters of Yellowstone halt. Could refer to memorable frozen water sites such as Ice Mountain in Colorado or Ouray Ice Park. “Warm waters” are often noted by wildlife/game entities as streams, lakes, ponds, except those designated as trout waters. The fishing regulations in New Mexico, where Fenn lives and fishes often, refer to areas where you cannot fish for trout as “warm waters”. Some believe this could be a reference to sand dunes. Other specific locations suggested include Rio Grande River to Rio Grande Gorge State Park, where the Red River joins Rio Grande, Jemez hot springs, Gardiner Montana (near Yellowstone) to Yankee Jim Canyon (Yellowstone to Missouri), Dry Cimarron River, Brown Ranch, Devil’s wash basin, Eagle Nest Lake, Warm Springs Cliff in Dinosaur National Monument. Could be a directive to go down into a canyon. Or could be specifying the location as underneath a canyon ledge (which to reach, may require approaching from the bottom, not necessarily the top). Could refer to a specific location name such as Sinks Canyon, Wyoming. Requires a vehicle to access as the distance is too great to walk. Note that “far” is relative. Fenn once said he walked 91 miles as a child. Could be referring to time. Could be referring to the type of transportation required – e.g. the treasure is close but a boat or rope must be used to reach it. Could hint that boat or horseback is required or recommended. Could be describing a location where a boat should be launched. Possibly “put in” is simply indicating a point to start from as in “begin here”. Lamar Valley Ranger Station in Yellowstone used be the home of a ranger named Gary Brown (1965). Bannock trail is located near the station. There is a stable here which could hint that the treasure can only be accessed via horseback. Could refer to the city of the Molly Brown, Brown Canyon in southwest Colorado, Brown’s Hole in Yellowstone, Brown’s Landing in Marble Canyon, Fort Brown (Lander, Wyoming), Casa marron (means “brown house”). Arthur Brown was a painter of Yellowstone landscapes in the early 1880’s. Could refer to brown bear – the only grizzlies (brown bear) in the mapped area would be Montana and Wyoming. There are no brown bears in New Mexico or Colorado. Could refer to brown trout. Something dangerous nearby? Rapids, mountains, cliffs, or simply a wilderness area. Possibly simply a line intended to promote excitement in the reader. Could refer to time of day (sunset) or the end of the road. Could simply mean “you are getting close”. The archaic meaning of “nigh” is “on the left”. Could refer to a dry stream or riverbed (an Arroyo). Could refer to a rapids on a river. Could refer to mountainside that must be climbed or walked up. Possibly refers to a body of water that is *not* used for rafting. Could refer to a waterfall that cannot be reached by boat. Heavy loads could refer to boulders and rapids. Could refer to a dry stream or riverbed that only fills up with water when it rains. Could refer to a bridge (heavy loads suspended over deep or rapidly flowing water). Possibly refers to a rise in elevation. Could refer to boulders, waterfalls, electric wires, or a place known for heavy loads (e.g. mine, railway station). Some have pointed out various quarries next to rivers in the area. Could refer to deep water or water located at a high elevation. Could refer to a moist, dripping cave located on a mountainside. Blaze could refer to some sort of special mark or sign. Could simply refer to the final resting location of the treasure. Could refer to sunlight or fire. Possibly reference to reddish color rocks or cliffs. Direction such as south, downstream on a river, or a lower level elevation. Don’t delay or don’t stop and stare – could refer to a magnificent view or sight. Could refer to the chest itself (bronze is cold). Could refer to a cold climate. Possibly a hint that the treasure will be easier to find during winter months when vegetation is sparse. Possibly a forest or wooded area. Possibly referring to a specific hiding place such as a hollowed out tree trunk or underneath a fallen down tree. Many have felt certain they knew where the Forrest Fenn treasure was located. One man convinced himself the treasure was in the Rio Grande Gorge in New Mexico, close to the border with Colorado. Remarkably, he’d managed to locate a large house on the edge of a steep drop that overlooked a gushing river. Outside that house was a sign that read: ‘Brown’. He read Fenn’s poem aloud again: “Put in below the home of Brown.” He figured this had to be the spot. It wasn’t. What follows are several theories regarding the Forrest Fenn treasure’s location. Well, the first clue is: ‘Begin it where warm waters halt.’ So, we are looking for a hot spring in Northern Yellowstone Park. And, not just that, we are looking for one roughly ten miles away from the Lamar Ranger Station (‘not far, but too far to walk’). Fenn has also mentioned that he drove to place the treasure. So, we are looking for a hot spring roughly 10 or 15 miles away from Lamar that you can drive to – with a canyon below and in-between (‘take it in the canyon down’). Does anything fit that bill? Well, surprise, surprise – just a 10 mile drive away (along the only road) is the only major hot springs in northern Yellowstone, Mammoth Hot Springs! And, not surprisingly, there’s a canyon in-between (just zoom out a little bit on the map linked above)! It fits the clues PERFECTLY. There, we have the first 4 clues SOLVED! And they lead us to the Lamar Ranger Station in Yellowstone. Well, technically, just below the Lamar Ranger Station. And, what’s below it? Right, some beautiful streams. So, what about the other 5 clues: From there it’s no place for the meek, The end is ever drawing nigh; There’ll be no paddle up your creek, Just heavy loads and water high. If you’ve been wise and found the blaze, Look quickly down, your quest to cease. ‘No place for the meek’ seems to imply that it’s somewhat dangerous from this point. Either dangerous – or wet perhaps. So, you’re going down below the Ranger station – then choosing the direction which looks dangerous or hard (likely in the opposite direction of Mammoth Hot Springs). ‘The end is ever drawing nigh’ seems to imply the end of a stream or river (it’s always ending but never does). ‘There’ll be no paddle up your creek’ tells us we are going upstream, and we are wading, not using a boat (he’s a fly fisherman, remember). ‘Just heavy loads and water high’ seems to be another reference to wading. We are going to have to get wet while carrying the treasure. Like chest high. Or, since we are going upstream, there are bound to be locations where the stream is above you (rapids or waterfalls, etc…). ‘Heavy loads’ could mean load as in architecture/engineering. So, we could be looking for an over-hanging cliff of some sort with a waterfall on top. Or, of course, it could just mean we are travelling up-hill along the stream. Fenn also mentioned that it took him two trips (totalling an afternoon) to take the treasure from the car. So, ‘heavy loads’ implies carrying the heavy gold and chest in two loads. Oh, and I guess it’s worth mentioning that people believe he hid the treasure while staying in Cody in Sept. of 2009 (and, Cody’s the closest town to the area we are looking at). So, we are looking for a secluded area you can only get to by wading approx. half an hour up a fly-fishing stream. A stream which terminates right below the Lamar Ranger Station. ‘Tarry scant and marvel gaze’ is a really odd turn of phrase. In fact, ‘tarry scant’ doesn’t even make sense (which is odd for a highly-crafted poem). There should be a comma after tarry, making it the equivalent of ‘tarry gaze’, but there’s not, so tarry is referring to scant. So, that’s probably important. Perhaps the chest is near some sort of small, out-of-place tar pit. Does Yellowstone have tar pits? Yes, yes it does. Are there any in the vicinity of the Lamar Ranger Station? I don’t know. Given all that, it really narrows it down to only a few locations. If I was a fly-fisherman, I’d be planning a series of trips to the Lamar Ranger Station this year. You know he had to have discovered this spot on a fishing trip to his favorite fishing hole as a kid. If you can figure out what blaze means (which sounds like something you need to be there to see), you should probably be able to narrow it down to a very small location indeed. And, even what we have so far is probably enough to find the treasure (if you have a few days or weeks to go searching). But beware, the last clue seems to imply that it’ll be easy to miss unless you’re looking for it at the exact spot you see the blaze. So, think secret grotto of some sort or behind a waterfall, something like that. My best guess is that we’re looking for a grotto/cave/waterfall/embankment roughly 3 miles upstream from the Lamar Ranger Station. I did a little searching around old maps of Yellowstone and… There are 2 potential tar pits near the Lamar Station (or, features releasing hot water/tar/sulphur anyways). Think “Blaze”. “And take it in the canyon down” * The canyon down is referring to the Gardiner Canyon, south from Gardiner. “Not far, but too far to walk” * So you go by car, following the road through the Gardiner Canyon. “Put in below the home of Brown” * Put in has the meaning of “disembark”, “get off transportation”. * “below the home of Brown” is an adjunct modifying the verb “Put in”. So you get out of your car just below Lamar Range Station (following you Home of Brown theory). “From there it’s no place for the meek” * It gets harder now because you are out in the elements, walking. “The end is ever drawing nigh” * “Nigh” is meaning “near”, but also “in the left side”. You have to choose left at all times. What is to the left? Bison Peak. And the Rose creek. “There’ll be no paddle up your creek” * You have to go up Rose creek, not Lamar river. Choosing left if (when) it splits into two creeks. You will have to walk, can´t paddle it up because it is a classic mountain, whitewater creek. “Just heavy loads and water high” * I´ve done some trekking and kayaking with my brother. It´s a common topic of conversation during our trips the fact that you can carry a lot of load in the kayak without noticing. In contrast, hiking with a backpack can be painful, sometimes to the point where you end up regretting your heyletsbringthisshititmightbeuseful backpack preparation criteria. * So I think “heavy loads” here is in tandem with the “no paddle up” of the previous line. Water high is again telling us that we are climbing a mountain creek, gaining altitude. The blaze is clearly referring to the mark(s) in the path, as was said in the comments. You have to be there to find it. I agree with the explanation, tarry is used as a verb: “Don’t be tempted to linger there and stare at the marvelous view”, where the view is both the chest and the landscape (we gained altitude and might be at a nice panoramic viewpoint here, near Bison Peak). Also, it´s common knowledge between mountaineers that you can´t waste time when you are up in the mountain, because you have to descend before it gets dark or the weather changes. “Tarry scant” might be pointing in this direction. I agree that it might be under water, since FF said something about the chest being wet. And you could see it just looking down at a certain spot, no need to dig. In Dinosaur National Monument, there’s a cliff titled “Warm Springs Cliff”, and at the base of that cliff on the other side of the Yampa river, there are a couple of actual warm springs, I think this is where he’s telling us to start. Even though it’s not a canyon per say, he could be talking about going down to the base of the cliff where the actual warm springs are, and not the cliff of the same name. The base of the cliff isn’t far, but you can’t just walk down the cliff, you gotta get to the other side by driving. Dinosaur National Monument is directly below Browns Park National Wildlife Refugee. Another theory is the Yampa river is populated by Brown trout, which could represent Fenn’s hobby of fishing and catching brown trout. I have a couple of interpretations for this one… I’m thinking it’s either a reference to Dinosaurs, which have a connotation to be frightening. My other theory is the Yampa river is fairly treacherous, full of rapids, so not a place for the meek! You’re getting close to the treasure. There’ll be no paddle up your creek, Just heavy loads and water high. This one is a bit of a stretch, but I’m thinking he’s saying the water is high, as in elevation (above 5,000 feet) and I believe the heavy loads are heavy loads of water from the bustling river. As for the “No paddle up your creek”, I’m thinking he’s telling us we need not venture into the dangerous waters of the river, that his treasure can be accessed safely from the shore of the river. That or he’s telling us that we can’t paddle up stream (if accessing by raft) since the rapids are fairly wild, and that your boat will be taking in ‘heavy loads’ of water from the rapids. I know I know, a stretch, but I thought it was worth considering. If you’ve been wise and found the blaze, Look quickly down, your quest to cease But tarry scant with marvel gaze, Just take the chest and go in peace. Thanks to Google street view, someone from Google rode down the river with a camera giving us a good view into the riverbank. Check this out. This is where I think the treasure is hidden… When I first read “blaze”, my first thought was ‘fire’. At first glance, the cliff across the river has a prominent red area which I initially thought was the giveaway… However, if you turn around 180 degrees, look on the shore… You should notice this rock labeled as ‘1’ which stands out prominently above the rest.. It’s a much deeper shade of red than any of the other rocks and just screams “blaze” to me… If that wasn’t enough, look at the second bubble I circled with ‘2’… That’s a marker (or a blaze) that says “Warm Springs” on it… Recall “start where the warm waters halt”… And a third option is the group of trees between the 2 things I circled, that could be the ‘blaze of trees’ some people talked about. I have a feeling if the treasure is there, it must be hidden underneath that tree shielded by a few rocks and shrubs. So why is it that I must go And leave my trove for all to seek? The answers I already know I’ve done it tired, and now I’m weak So hear me all and listen good, Your effort will be worth the cold. If you are brave and in the wood I give you title to the gold. He may have hiked in there with the treasure and is now weak from the strain of it… Or he rafted in there (but I think that’s unlikely). I’m not done yet though… To add more possibility, I read up on Dinosaur National Monument and found out that unlike many natural parks, everywhere in the park is accessible to the public… Which I’m sure Fenn thought about when hiding the treasure since he intended it to be a family adventure and would want to make sure you couldn’t get in too much trouble… Not only that, but there are numerous “back roads” in the park that you are allowed to drive on when conditions allow… I’m not sure where the closest road or back road is to the suspected hiding place since I’m working off of a satellite image of the park, and I’ve only known of the park for the last 24 hours… But I’m assuming there must be one not too far away so that rafters can access the rapids. Not only that, but the terrain leading up to the suspected area is fairly flat, so it would be accessible to a weary senior like Fenn… And the beach where the rafters are perched looks like a nice place to fish, so maybe Fenn liked to fish for trout there? This area seems to check all the boxes… If you pan around and view the surroundings on street view (or river view), you can see trees… I don’t see ‘mountains’, but there are sheer beautiful cliffs which he could be alluding to… As for animals… Maybe he’s alluding to fish in the stream, humans rafting down the river (which could also explain how people have been within ‘500 feet’ of the treasure according to Fenn), insects in the air, etc… The biggest red flag to me, is that the suspected tree where I think the treasure is hidden, appears to be a pine tree, more specifically a Colorado pinyon which he specifically mentions (seems kind of odd he’d be so specific). 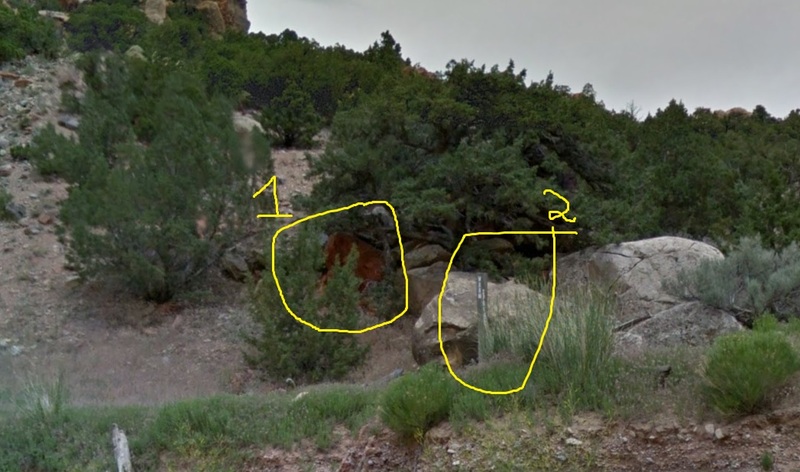 Also, there appears to be sage bush to the direct right of the ‘Warm Springs” post. It all seems to add up. I’m not sure why the chest would be wet, perhaps a small stream goes right under the chest into the river? Maybe an aquifer or spring pops up right next to the chest. Not to mention the “it’s not in Idaho or Utah” hint seems to indicate that it’s not in New Mexico either. Personally I think he would be direct about it being in New Mexico, if it truly was. I think he’s trying to throw people off. It’d be an obvious conclusion to think it’s hidden in New Mexico, but he might be trying to throw everyone off. My latest interpretation brings me to Tusas Mountain in the Carson National Forest. I realized there were some numbers in that line. Specifically three ‘one’s. Then I realized you could read a few different ways if you get really loose with it. So lots of interpretations if you are going to go this route but I stuck with my original. Googled around for state routes ‘111’. Found one in New Mexico leading in to the Carson National Forest. Ok that’s …whatever but let’s continue. As I was researching rt. 111 I found it’s description on Wikipedia. If you interpret it this way you have a road, a starting point, and a direction. not far, but to 42. walk. So a road, a start, a direction, a stopping point. rt. 42 is a very short section of 111. But right smack dab in the middle of it is the Cleveland Gulch. Cleveland Browns. Now I know a sports themed clue is lame as hell. But 1) It’s the only thing that has anything to do with Brown around there. 2) If you think about it Cleveland is literally the home of the Browns. As dumb as it is it still makes perfect sense. 3) A sports clue is something you could always research so it is everlasting. 4) There is no rule against sports themed clues. Obviously something changes about this part of the poem. If you follow this interpretation then it is a signal that you should be walking now. If you look at Google you will find a faint trail through Cleveland Gulch leading towards Tusas Mountain. It’s practically non existent on the satellite but it is on Google. sorry I don’t have a good idea for this one. This could be reassurance you aren’t following Spring Creek but rather the actual Gulch. He is telling you. Stop. Get out and walk. Walk through the gulch not the creek. Perhaps there is a clue in this. The Tusas Mountain range is a geological gold mine (figuratively speaking) It’s very unique in it’s composition or so I have read. So it is a place of significance. Historically the settlers could never stay in that mountain range because of the cold winters. And also if you look on Google earth you can see ‘Burned Mountain’ from the top of Tusas. So maybe it’s at the top being that you have ‘found the blaze’. A response to this theory with additional thoughts. Really good take on this. Im not quite sure about the end part though, being on top of Mount Tusas puts it above 10,000 feet which Fenn has said it is not above that. To me it seems strange go north up Cleveland Gulch, when it says “Put in below the home of Brown,” from here I would assume that you are actually in a boat (or at least following) Spring Creek. The fact that “There will be no paddle up your creek” makes me more confident that he wants you to follow the creek. He could have used any word for a flowing body of water (river, stream, etc.) but he chose to include the name of the body of water in the clue. With no paddle up your creek, you are going with the flow of the water. Now, Im guessing on what why the Spring Creek flows, but assuming that it follows along Route 91B, it ends at a very small lake to the east of Snow Course Tank. This could possibly be what “the end is ever drawing nigh” refers to, not the end of your hunt, but the end of the creek. As for the next clue, I am not sure about the heavy loads, but water high, could also be referring to the increase in water depth from the creek to the small pond. “Look quickly down, your quest to cease” this I’m assuming means that the chest is at the bottom of the pond. Not only has Fenn mentioned that “the chest will be wet,” but the part look quickly” might refer to the fact that this must be done only while you can hold your breath, therefore quickly. Anyways, just me thinking about an expansion on your part. I also live far from New Mexico, so I wont have the chance to explore this theory. Here’s one treasure hunter’s theory. I believe Fenn’s treasure is located in Montana, furthermore, northern Montana. Let me explain…. Brown is capitalized. That struck me kind of odd, as I’m sure many other treasure seekers took note of it as well. Then I discovered Mt. Brown, located in… you guessed it, Glacier National Park, Montana. Montana is also known as “the treasure state”. It is also located only a short distance from a road which would explain how Fenn could have made 2 trips back and forth in one day (as he mentioned in an interview) The “too far to walk” line I’m still having thoughts about but so far it fits. Montana is definitely too far to walk to from NM but still in the map Fenn released claiming the treasure is within the highlighted area. Then the icing on the cake. I realized this [Note: The Thrill of the Chase bookcover, upside down, matches an outline of the map area the treasure is believed to be located in]. The cover of his book TTOTC when inverted perfectly matches the outlines of the states in the northwest. Wyoming even over laps Utah. Which state is represented by the gold? Montana. An even closer look also reveals that the one gold coin in the pile that reflects the light is exactly where Mt. Brown would be geographically located. I have a few more ideas about some other lines but nothing quite compelling yet (or that I’m willing to share. I’m always one step ahead of what I choose to post), just a bunch of speculation. However, most of the search efforts so far have been centralized around northern NM with little (who am I kidding, NO) results. I feel like if it was that close to him people would have found it already, especially since they are going to great lengths to decipher his lines but yielding very little results trying to match up landmarks with clues. Anyways, knowing how clever Fenn is with his writing he definitely likes to employ the double entendre and probably has a few red herring in there as well, but I was wondering what you guys think of my findings. Most people probably assume the thing he wish he hadn’t said is about the treasure chest being wet. I believe it was the scent of Pinyon nuts. No Pinyon pine grows in Montana or Wyoming. It’s a quick overlay I did of Wikipedia’s Pinus edulis range map and Forrest Fenn’s map of the treasure area from his book. It isn’t perfect, but it really narrows down the search area. Below are additional resources to assist you in the quest for Forrest Fenn’s treasure. Forrest Fenn can be reached by email at ffenn@earthlink.net. Copies of his books can be purchased through Collected Works Bookstore (order online or call 505-988-4226). Below is a pictorial collection of maps, pictures, and other tidbits related to the Forrest Fenn treasure hunt. Aug 1930 FF was born in Temple, Texas. 1939 FF found his first arrow head. FF was 9. 1930’s – 1950’s FF, his father, and Concy hunted for Indian arrowheads. Early 1940’s FF’s father had a summer cabin in West Yellowstone where the family spent summers. Sep/Oct 1950 FF joined the Air Force 3 months after Korean War started. FF was 20. 1953 FF learned to fly. FF was 23. Dec 1953 FF & Peggy wed. FF was 23. 1959 Zoe Fenn was born. FF was 29. Vietnam War (1959 – 1975) FF was 29 – 45 respectively. Early 1960’s FF trained fighter pilots at Luke Air Force Base near Phoenix, AZ. 1970 FF retired from Air Force after 20 years of service. 1969 –1972 FF made bronze reproductions, sold some, and traded others for Indian artifacts. 1972 FF and family moved to Santa Fe with $20k and started Fenn Galleries, LTD. FF was 42. 1986 FF’s father took his own life after suffering from cancer for many years. FF was 56. 1988 FF was diagnosed with having cancer. FF was 58. 1988 FF closed Fenn Galleries and began writing books and digging at San Lazaro. FF was 58. 2006 FBI investigated FF for antiquities theft but FF was never charged. FF was 76. Prior to 2009, FF sold his plane and stopped flying solo. 2009 – 2011 FF hid his chest. FF was 79 – 81 respectively. Oct 2010 FF released The Thrill of the Chase: A Memoir. FF was 80. Several people have died searching for the Forrest Fenn treasure and Fenn has explicitly emphasized safety for all treasure hunters. For those considering a trek into the outdoors to hunt for the elusive treasure, Fenn says the treasure is not difficult to get to. I AM: CHINHSEOUL – I COULD HAVE DECIDED MY CODE! THIS IS IN PUEBLO NEXT SINCE THE DAY OF 1990. THIS IS IN THE NATIONAL PROTECTION WORKERS! I STILL HAVE THIS! CALL FOR BANG! It’s too hard for me to decide! I DECEIVED THE CODE IN 15 MINUTES!